I'm starting the year out with more custom projects! 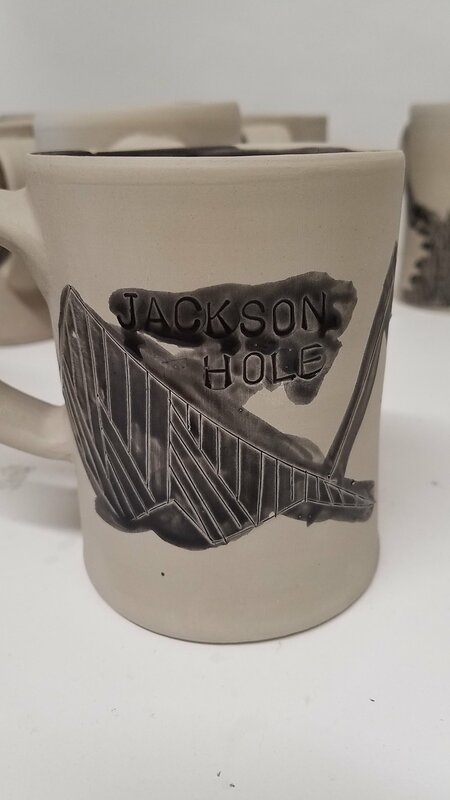 This Jackson Hole mug is now available exclusively at Workshop, just off the square in Jackson. The design is made using an inlay technique. I hand stamp the letters, which makes them a little wonky, and score the damp clay with an xacto blade. The surface is coated with black underglaze and then sponged off, leaving narrow lines inlaid in the clay. While similar, each design is a little different. The variety is fun for me and also makes for sets of interesting mugs- all related but still unique. 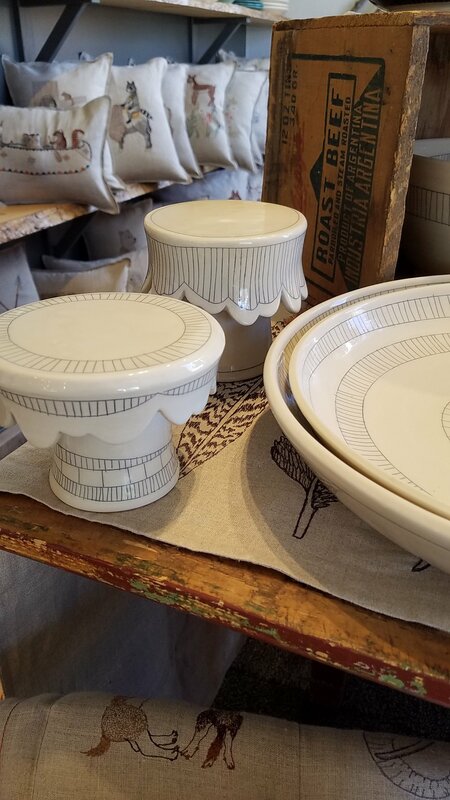 Find my mugs, platters, bowls, and cake stands at Workshop, along with lots of unique handmade items- a perfect place to find a gift, for you or someone you love! I may be taking a bit of a summer break, but not in the studio! Lately I have been working on orders for shops and restaurants, as well as building up my inventory for upcoming fairs. One project includes the cute little cupcake stands that I am making for Workshop in Jackson. Each cupcake stand is thrown in 2 parts, I make the top (where the cupcake goes) upside down and then throw a cylinder for the stand. After shaping the edge and smoothing out the clay, I attach the 2 pieces. The surface decoration is an inlay or mishima process. 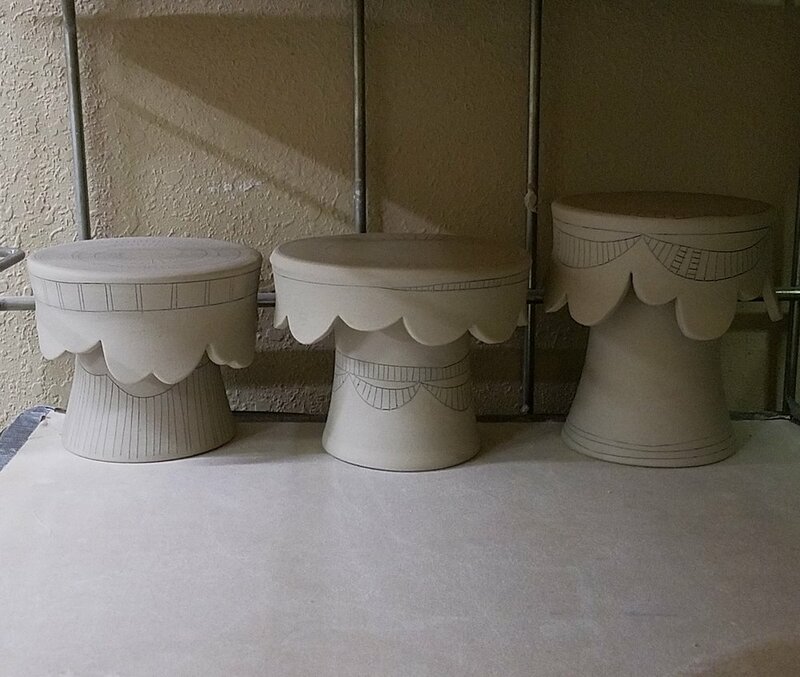 I use a sharp blade to cut into the clay making an interesting pattern, then I brush black underglaze over the cuts. 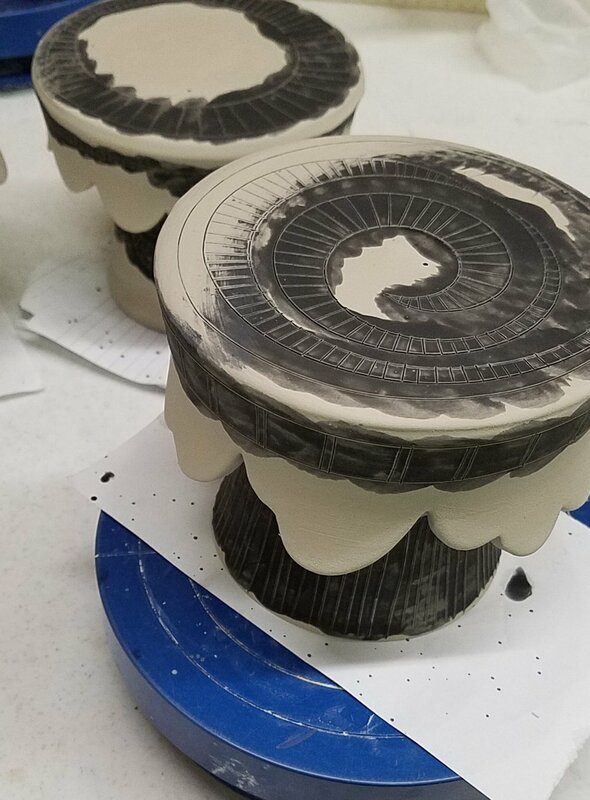 Once it dries I wipe off the extra underglaze with a sponge- leaving delicate lines inlaid in the porcelain. If you are in Jackson, be sure to stop by and check out Workshop! 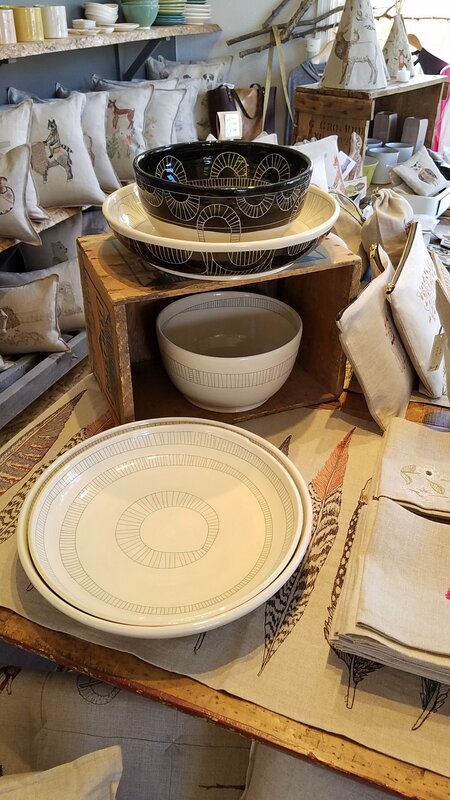 Everything in the shop is handmade and unique. Each of my items is one-of-a-kind: cupcake stands, bowls, platters, ring cones, and ornaments! One of my newest ceramic products is the Ring Cone. An elegant way to safely store your rings! The ring cones made their debut this summer at Art Fair Jackson Hole, where they posed for a photo with rings made by Sarah Tams. 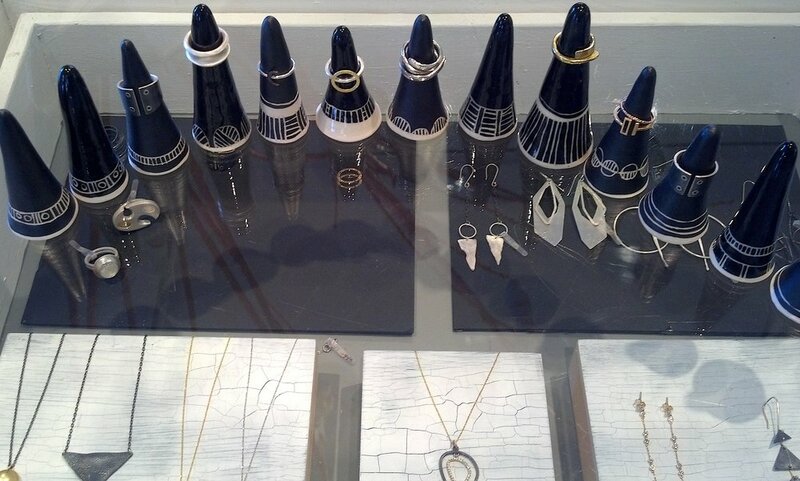 Now the ring cones are available in Workshop, where they also display rings made by Susan Fleming! I'm excited to have my ring cones at Workshop, a great shop in Jackson, WY with unique handmade items, made by artists all over the country. I've been working on getting new products out and placed before the holiday season. Stay tuned, there are more locations where my pottery will be found coming up!